First of all we would like to say a great Happy New Year 2012. Almost 8 Months, Symbian^3 Indonesia has been on the Internet. We also would like to say thank you for all followers, readers of this blog. We are open for your critics, suggestions and ideas. If you have product review, application review, tips & tricks don't hesitate to contact us. The selected review/Tips & trick will be posted in this blog. 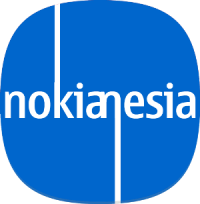 Special Thanks to Reza Muhammad (@whousah) for the idea of brand "nokianesia"